The U.S. Bicycle Route System is the national cycling route network that’s serviced by state and local governments. Its goal is to connect bicycle routes across the entire country for safer, long-distance cycling. With this designation, it allows each state’s Department of Transportation to map and post signs for cyclists along their portions of the Mother Road. Missouri is closest to reaching its designation, said Patrick Tuttle, Joplin Convention and Visitors Bureau director. He said the state agencies must make the April submission deadline in order to be approved by this year. “The feedback has been very good and very positive,” Tuttle said. “They all understand the value of Route 66 and the value of tourism coming through.” . . .
USBR 76 was the first national bicycle route designated and signed in Missouri, according to Brent Hugh, the executive director of the Missouri Bicycle and Pedestrian Federation. The federation works to make the state a safer and more accessible place for nonmotorized trail users. USBR 66 signage will be similar to the wayfinding signs on USBR 76/TransAmerica Trail in Missouri. A few signs will be installed in time for BigBAM in June 2017, but we are still seeking funding for the remainder of the USBR 76 wayfinding signs across Missouri. 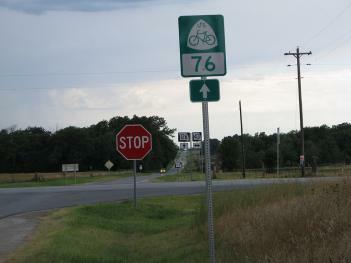 The signs posted along USBR 76, which gives cyclists directions nearly turn by turn, would be similar to the ones posted to Route 66 once it becomes a designated bicycle route. Bicycle Route 66 is one of seven cross-country bicycle routes that cross Missouri. 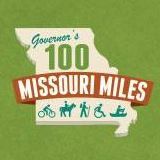 Find out more about all cross-country and cross-state bicycle routes in Missouri on our routes & maps page. Working to create a seamless statewide system of bikeways and trails--like Bicycle Route 66--is one way we reach our goal of creating a world-class bicycle and pedestrian transportation network in Missouri. That is one of four primary goals of MoBikeFed's Vision for Bicycling and Walking in Missouri.